Close to 300 lots in a recent London sale that focused mainly on private press and other illustrated books came from the library of the late Bruce Beatty, a banker whose artistic and bibliographic collecting preferences included fin de siècle literature. A number of lots from that collection, sold by Forum Auctions (25/20/12% buyer’s premium) on January 30, are described here, along with a few items from other sources that made up this 570-lot sale. When, in 1899, Edward Gordon Craig realised just how laborious hand colouring the illustrations in all 550 copies of his privately printed first book would be, around half that number were destroyed. 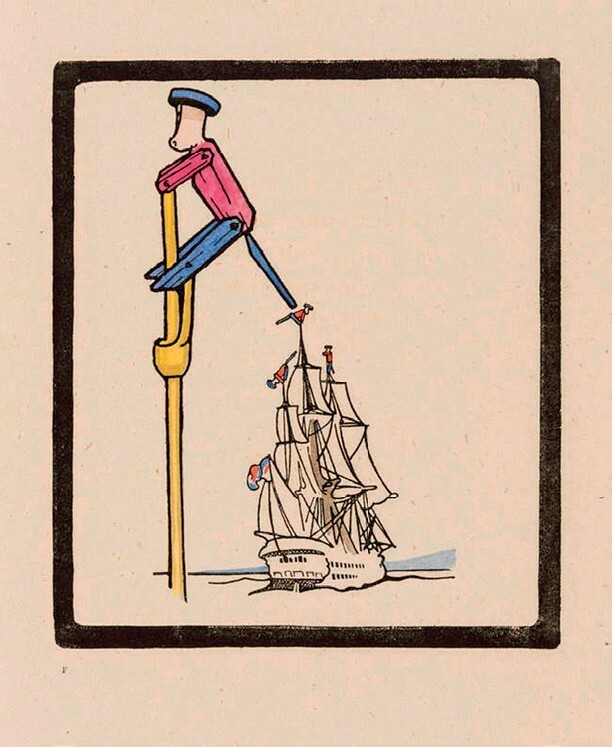 One of the 250 copies of his Book of Penny Toys that escaped the flames, one that also had the rarely seen illustrated prospectus tipped-in and bore a bookplate created by Austin Osman Spare for the designer and collector Pickford Waller, made £3800. Sold at £7500 was one of the main run of 300 copies of the 1930, Cranach Press edition of The Tragedie of Hamlet Prince of Denmarke featuring Edward Gordon Craig’s wood-engraved illustrations. Containing a tipped-in example of an extra but very rare signed print showing Hamlet descending stairs while reading a book, this copy was also inscribed by the illustrator for Janet Leaper, author of a 1948 King Penguin book on EGC’s theatre designs. The Queen of the Fishes, an English adaptation by Margaret Rust of a ‘Fairy Tale of Valois’, was the first book issued by the Eragny Press, in 1894 – and the only one not printed in what became the familiar Vale type. With coloured wood-engraved illustrations and borders designed and executed by Lucien Pissarro, one of 150 copies in original limp vellum made a record £3800. Rust’s book was inscribed by the wood engraver Philip Hagreen to Laurence Hodson, a patron of artists of the Arts & Crafts movement, but also bore William Foyle’s Beeleigh Abbey library label. It sold at £1900 in the Christie’s sales in 2000 of that collection. Sold at £8500 at Forum was a copy of the 1931 Golden Cockerel edition of the Four Gospels… illustrated by Eric Gill, bearing a Christmas gift inscription from Hodson to his daughter-in-law. The binding of Silverpoints by John Gray – £7000. Bid to a record £7000 was one of the 25 large paper, deluxe copies of Silverpoints by John Gray issued by Ekin Mathews & John Lane in 1893. A poet and translator, Gray became a Catholic priest in later years, but was the lifelong partner of Marc-André Raffalovich, a French writer on homosexuality, and as a one-time protegé of Oscar Wilde is believed to have been the model for ...Dorian Gray. The tall and narrow volume has a gilt decorated vellum binding by Charles Ricketts, who also designed the decorative initials. One of 10 vellum copies of the 1899, Vale Press edition of Coleridge’s Rime of the Ancient Mariner, featuring wood engraved borders and initials by Ricketts, made a record £4500 and Ricketts’ work featured again in an 1897, Vale Press edition of Elizabeth Barrett Browning’s Sonnets from the Portuguese sold for £3000. 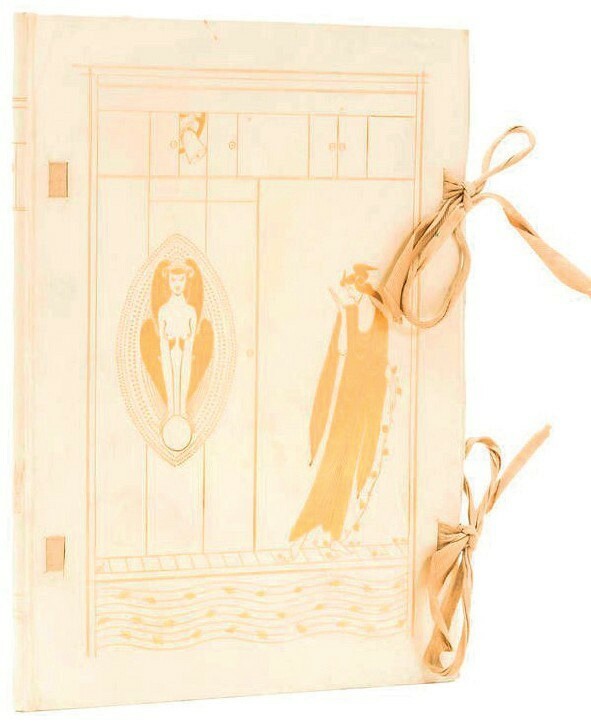 In an elaborate hand-painted and gilt vellum binding, the latter was a copy inscribed in 1945 “To our dear friend Mother Mary Clara from John & Una” – the former being a nickname used by Radcliffe Hall, author of The Well of Loneliness, and Una that of her lover, the sculptress Una Troubridge. Wilde’s name was linked with two of the sale’s more successful lots and bid to £17,000 was yet another book featuring the work of Ricketts – one that is considered his masterpiece. An 1894 edition of The Sphinx was one that he designed as a complete entity, from illustrations, decorations and layout to the pictorial vellum gilt binding, the latter produced in collaboration with Henry Leighton. Sold at £14,000 was an 1888 first in original boards of The Happy Prince… that Wilde signed and inscribed “from his friend and admirer” for presentation to the artist Mortimer Menpes. 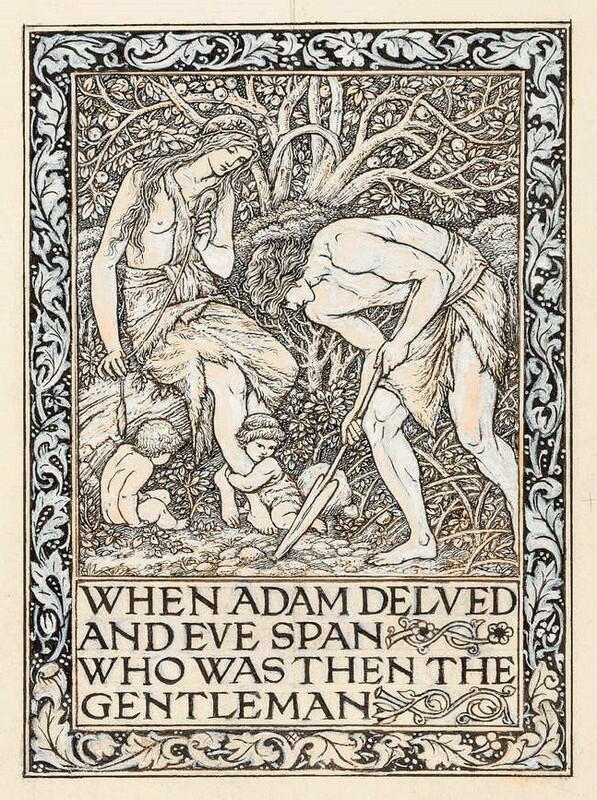 A number of Kelmscott books appeared in the second part of the sale, among them a slightly soiled but generally good copy of Keats’ Poems of 1894 that made £5500 and, at £8500, the ink over pencil design by William Morris for the frontispiece to ‘A Dream of John Bull’. Last seen at Sotheby’s in 1983, it bears a pencil note at the foot stating that it came from the collections of Charles Fairfax Murray, who became artist and illustrator Edward Burne-Jones’ first studio assistant in 1867 and later worked for Morris as an artist and copyist, preparing his illustrations for engraving. He would draw over a pale photograph image of original drawings, first in silver-point or pencil and then in ink with a fine brush, before they were transferred photographically to the woodblock for engraving. In this case it is unclear as to whether the border and caption is the work of Morris himself or similarly copied, said Forum. Sold for a record £12,000 as part of the mixed property section was a 1969 limited edition copy of Sir William Russell Flint’s autobiography, In Pursuit, that was bound in 1971 by Elizabeth Greenhill in blue coloured goatskin with multi-coloured cloud onlays. ‘The Lament’, an ink drawing by Jessie M King – £13,000. 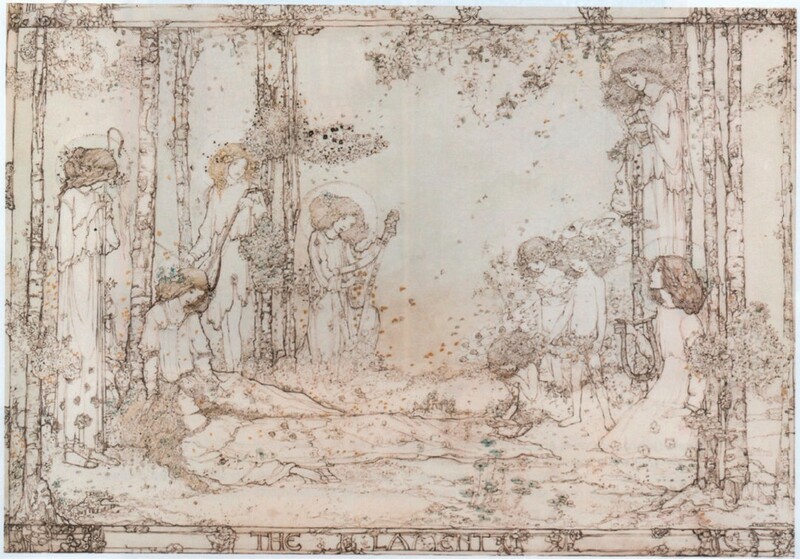 Not seen at auction since a 1975 outing at Sotheby’s, ‘The Lament’, an ink drawing on vellum by Jessie M King, probably dating from the 1890s, sold for £13,000. Among the modern firsts in the sale was a presentation copy of the 1946, first US edition of The Stranger by Albert Camus. Such inscribed copies are exceptionally rare and this one sold at £12,000.